We have developed programs that provide opportunities for boys and girls, ages 2 to 18, to not only work-out in a safe, fun, family atmosphere, but also to learn gymnastics and life lessons. We want students in each of our programs to learn things about their bodies, themselves, and success in general; How hard can I push myself? What’s the proper way to stretch? How do I care for basic injury or sore muscles? How do I concur fear or self-doubt? How do I set proper goals? What makes a good teammate? How can I be a good leader? Some of our programs are designed to introduce those kids to the great sport of gymnastics that may not have had any experience with the sport. 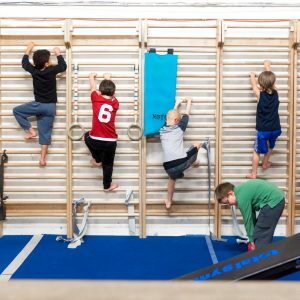 Open Gym (Parent’s Night Out) is a great way for kids to try out the equipment (we won’t let them do skills that they aren’t able to perform safely), invite friends, and have a few hours of fun while really getting a good introduction to the whole gymnastics experience. Birthday parties and field trips are two other events that NGTC offers that provide a similar experience along with lifelong memories. Mommy and Me, Pre-school and Recreational Level 1 classes are basic entry level classes that afford a more structured environment for the student. Every class is limited to an 8-1 max student/teacher ratio in a full one-hour format to ensure every student gets the attention and instruction he/she needs. The classes progress in age and difficulty, of course, but one thing remains constant: we take every opportunity to teach and enhance the child’s understanding of himself or herself in helping them develop...Habits…for a Lifetime!